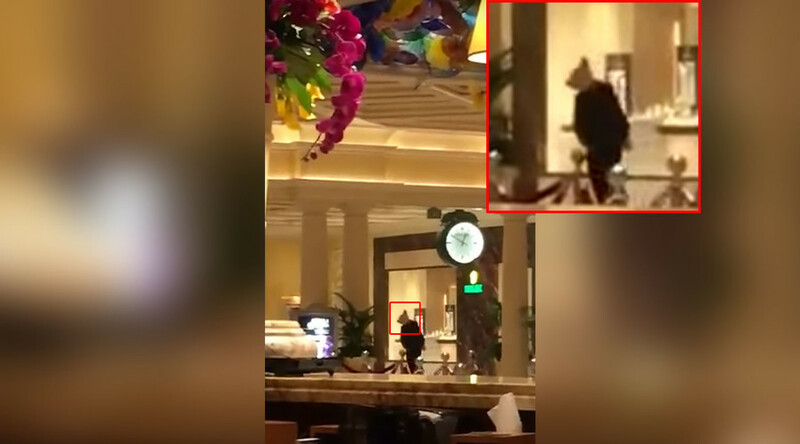 Police in Las Vegas have arrested three well-dressed suspects wearing animal masks, including a ‘pig’ in a suit, after a jewelry store at the iconic Bellagio luxury resort and casino was robbed. Police later confirmed that no shots were fired but the storefront and display cases had been smashed with a sledge hammer. At least three suspects entered the premises wearing “dark, nice suits” or tuxedos and animal masks, Metro Lieutenant Carlos Hank told the Las Vegas Review Journal, adding that they cast off their outfits as they fled with items stolen from the high-end store. “It is like a movie, it’s just crazy,” he said. The Bellagio break-in occurred hours before a separate incident in which one person was killed and part of the Las Vegas Strip was shut down by police. One person was arrested over the fatal shooting. Eyewitnesses shared images of the bizarre burglary, from both inside and outside the Bellagio, on social media. A video from the incident shows the suspect in the pig mask standing guard outside the store before his animal mask-wearing accomplices join him and all three flee the premises. Three suspects were later arrested by Las Vegas Metropolitan Police, according to KTLA 5. Meanwhile, social media users were quick to see the humorous side of the unusual movie-like heist.